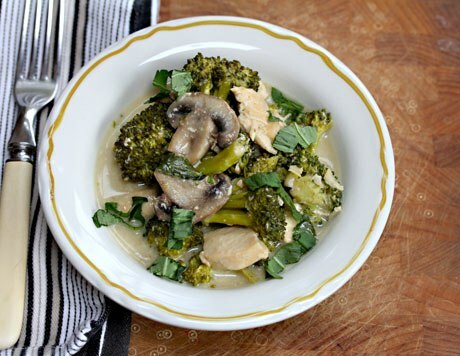 Chicken with Thai Green Curry, Broccoli, and Mushrooms, is cooked in the slow cooker for a delicious new way to make dinner with Thai flavors! Becoming a skilled slow cooker user is all about learning the timing of different ingredients, and I love the method Lydia uses in this Slow Cooker Thai Green Curry Chicken with Broccoli and Mushrooms from The Perfect Pantry. First chicken breasts cook in the slow cooker for 4 hours on low with the curry paste and coconut milk, which I’m sure seasons the chicken perfectly with those flavors. Then turn the slow cooker to high, add the broccoli and mushrooms (or vegetables of your choice) along with some fish sauce, sugar, and lime juice, and cook about 30 minutes more, add thickening and basil, and cooker a few minutes more. Lydia says fresh chopped basil added at the end is a must, and I’m sure I’d love everything about this dish. Get the Complete Recipe for Slow Cooker Thai Green Curry Chicken with Broccoli and Mushrooms from The Perfect Pantry. 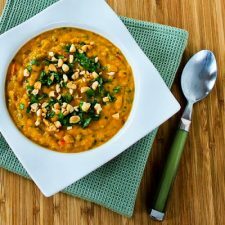 Use the Index Page for International Flavors to see all the slow cooker international recipes that have been featured on this site. Thanks so much for highlighting this recipe again. It's one of those dishes that tastes 100 times better than my photograph looks! Actually I don't think it looks bad at all. And it really sounds good too.